With the sweeping progress of the Industrial Revolution, Manchester became the world’s first modern city. Soft water from the nearby Pennine Ranges made it the perfect place for cotton manufacture and by 1830, 80% of the world’s cotton was processed here. The city mushroomed as factories sprang up and eager workers flooded to them. The wealth and prosperity of 19th century Manchester have left a legacy of great monuments, streets, squares and buildings, like Picadilly Gardens with its statues Robert Peel and the Duke of Wellington, the grand old Corn Exchange, the stunning Midland Hotel, the Majestic Town Hall and lovely Albert Square with its Thomas Worthington statue. The first modern industrial city gave birth to many other world firsts. The Manchester Guardian was the world’s first workers’ newspaper, produced in the largest print works in the world. The world’s first passenger rail trip ran between Manchester and Liverpool. The Manchester ship canal was the first to link ocean-going ships to a British city. Finally, at this time, the church at the end of Deansgate became Manchester Cathedral under the name of the Cathedral Church of St Mary, St Denys and St George and the Victoria Porch, with a figure of the Queen sculpted by her daughter, Princess Louise was added. Sadly but inevitably, slums, social problems and pollution followed in the wake of the great industrial growth of the period. After the Blitz of World War II, much of the heart of Manchester was rebuilt, including the beautiful circular library and St Peter’s Square with its Cenotaph. At this time too the stained glass of the Cathedral replaced the windows shattered in the Blitz. The last fifty years in Manchester have seen great development and growth, with such greats as the giant 1960s Arndale Shopping Centre, one of Europe’s largest. Work continues to reverse the environmental damage of the Industrial Revolution and its aftermath. 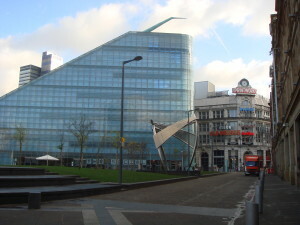 Run-down areas, such as the Salford Docks have been re-developed and the city has adjusted to accommodate new kind of urban dweller and to cater to their 21st century life-style. This has prompted many people to move into the Manchester area. A look at man and van hire in Manchester will show that the logistics of making the move happen couldn’t be easier. However the catalyst for the most important changes of the last fifty years was the 1996 IRA bombing which destroyed much of the area surrounding Arndale and the Print Works. From the ashes of the destruction has come Manchester’s most exciting development yet. The old print works is now a buzzing neon entertainment centre, facing a square where the Manchester eye turns against a background of little mediaeval buildings. Behind them, the spire of Manchester Cathedral stands against the sky. It faces onto a small square of green bounded by Chetham’s Music School and the Corn Exchange, now home to a complex of smart shops. Last but not least, there’s the sensational Urbis exhibition Centre, which points like a giant glass and steel phoenix back towards the old city. Manchester is a great city with great vibe. It is an exciting place to pass through, to pause for a some time and, I should imagine, to live in. It is vibrant, dynamic and alive with promise.